The deadline for the Letters About Literature student reading/writing contest is just a little over one month away on January 11. The Wyoming State Library invites students in grades 4-12 to read or reread a favorite book and respond with a letter to the author, living or dead, about how the book changed the way they see the world. Encourage the teens and tweens you work with to enter! Wyoming students could win a $150 Amazon gift card for first place, $100 for second, or $50 for third in one of three age categories: grades 4-6, grades 7-8, and grades 9-12. The top Wyoming letter in each category will advance to national competition where they could win up to a $2,000 cash award. This year, for the first time, entries will be accepted online through Submittable. Entries may also be mailed to Susan Mark, Wyoming State Library, 2800 Central Ave., Cheyenne WY 82002. All entries must be postmarked or uploaded by January 11, 2019. Both classroom and individual entries are welcome. Guidelines, entry form, and a teaching guide are available at read.gov/letters. 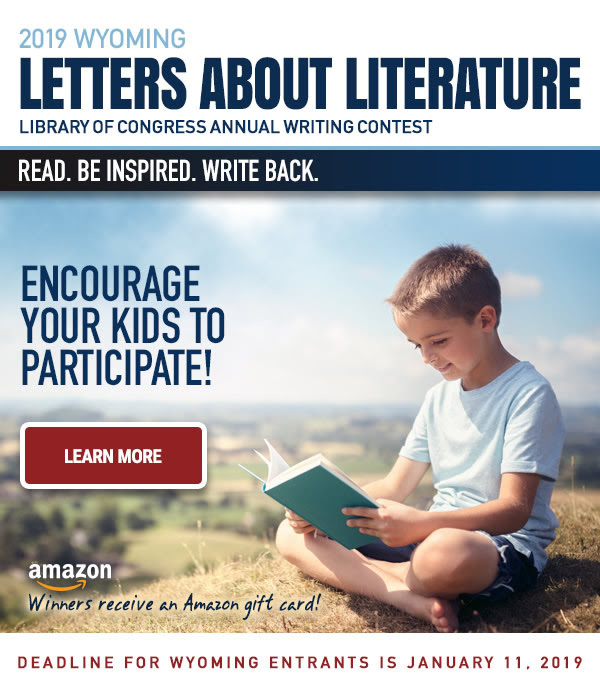 More information, promotional posters, and a link to submit may be found on the Wyoming State Library website at library.wyo.gov/literacy/letters-about-literature. Questions may be directed to Susan Mark at susan.mark@wyo.gov, (307) 777-5915 or Cary Dunlap at cary.dunlap1@wyo.gov, (307) 777-6338.